You may have seen recently that I signed up for a D23 Family Gold Membership! I was so excited to start going to fun Disney fan events…so far I’ve attended two (the Nightmare Before Christmas anniversary party and One Saturday Morning on the Lot), and both have exceeded my expectations. If you were a 90’s kid, you probably have a spot in your heart for One Saturday Morning, ABC Network’s Saturday morning line-up of amazing cartoons (including Recess, Pepper Ann, Teacher’s Pet, Doug, and later Kim Possible and The Proud Family were added to it in syndication). The event began with panels for a few of One Saturday Morning’s shows: a Recess panel, Teacher’s Pet, and Kim Possible. The creators of the shows were in attendance, talking about how the shows came to be, and showing storyboards and early concept sketches, and some of their favorite memories working on the show. During the panels, we saw clips of the shows, and all the theme songs (I instantly remembered all the words…it’s crazy how theme songs from our childhood seem to always stick in our head!). For the Kim Possible panel, the voice of Kim herself, Christy Carlson Romano joined the panel as well. I loved hearing about how much she still loves Kim to this day, and how she is honored by the fandom that it has. Also very exciting…it was announced as breaking news today that Christy Carlson Romano will have a role in the upcoming Disney Channel Original Movie Kim Possible in 2019! Meeting Christy Carlson Romano after the panel presentations. After the amazing panels, we had breakfast for lunch at Walt Disney Studios (with 90’s breakfast cereal there of course). 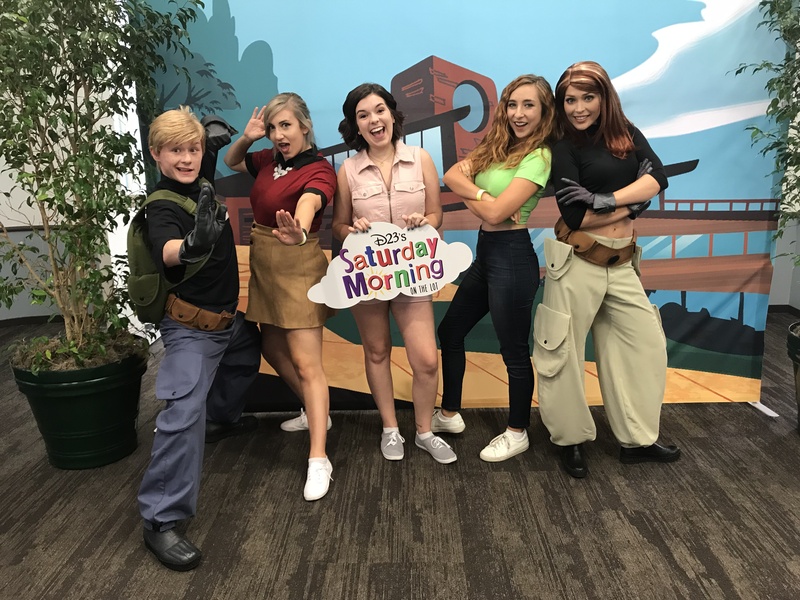 Along with “breakfast”, we were able to meet the talent on the panels and get their autographs, as well as take a picture with Ron Stoppable and Kim Possible! Each D23 event has a souvenir exclusive to the event. For D23 One Saturday Morning on the Lot, it was a set of 2 juice glasses with One Saturday Morning characters, reminiscent of the collectible juice glasses from fast food chains in the 90’s. Our gift for our Saturday Morning on the Lot event is #ThrowbackThursday goals 😍 Swipe up in our story to find out how you can be a part of this totally nostalgic morning! Disneybounding as school Kim, Ron and Rufus! The event was definitely one I’ll remember forever! Which One Saturday Morning show was your favorite? Hanging out for the D23 event with some of my Disney friends! If you want to learn more about joining D23, and the perks this year, you can visit my post about it here.